Containment tanks are subject to corrosion and abrasion at the hands of chemicals, extreme temperatures, and normal wear-and-tear. These factors can—and do—lead to expensive leaks and spills. Keep yourself, your tanks, and the environment safe. 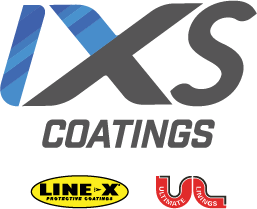 Talk to the experts at IXS Coatings, a Society of Protective Coatings (SSPC) member—and learn about industry-leading polyurea primary and secondary containment solutions. Safeguard your facility or job site—and the environment—from chemical leaks and spills with a durable, reliable secondary containment system. At IXS Coatings, we provide state-of-the-art pre-sprayed polyurea geotextiles that are guaranteed to deliver the highest quality secondary containment against leaks and spills. Our precise robotic application process minimizes labor and waste, making our pre-sprayed rolls a cost-effective answer for your secondary containment needs. And because we pre-spray our rolls in-house, installation at your site is quick and efficient. To experience minimal downtime and maximum protection, talk to us today. Stop leaks, protect against corrosion, and extend the life of your tanks. Hazardous chemicals and extreme weather conditions can cause your tanks to corrode, increasing the risk of leaks and spills. IXS Coatings’ spray-on polyurea primary and secondary tank coatings prevent corrosion. Our durable, flexible polyurea coatings are proven to protect your tanks from even the harshest elements. And with a vast array of customized, fast-curing primary and secondary tank coating solutions, we provide efficient protection for almost any project. Contact us today—and let us help you keep your tanks safe and long-lasting.